The life and adventures of a Southern California mom, with a Southern Heart! 2016 Epic Holiday Gift Guide Spectacular! Daily Dazzle Giveaway Link Up! Holiday Gift Guide Sponsor Information! Host Page! Falling into Autumn! Mother’s & Father’s Day Gift Guide! Perfect Pairings Valentines Gift Guide! Secret Word Page for Giveaway! Spring Fling Gift Guide – Celebrating All Things Spring! Swinging into Summer Gift Guide! Ultimate Valentines Gift Guide and Giveaway! 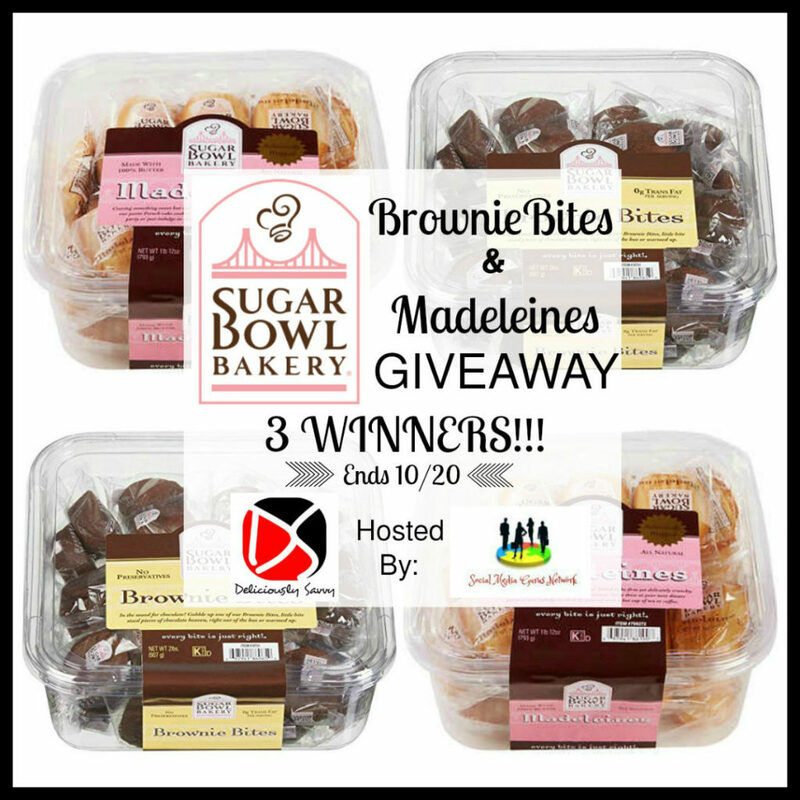 Welcome to The Sugar Bowl Bakery Brownie Bites & Madeleines Giveaway! This giveaway is part of our Fall Gift Guide – Stop by to see all the giveaways and great products. This contest is hosted by the Social Media Gurus Network! Below is a list of all the bloggers involved in the gift guide giveaways. PLUS a Big Thank You To All Promoting Bloggers Involved In This Fabulous Giveaway! This giveaway is in no way endorsed, affiliated, or associated with Facebook, Twitter or any other Social Media Networking Site. This Giveaway is valid in the United States Only and Entrants must be 18+ years of age to enter. This giveaway event will end at 11:59 PM (EST) 10/20/18. The winner will have 48 hours to email their information back to mcushing7 at hotmail dot com or a new winner will be drawn, you may want to put this email address as safe as it could go to spam. The sponsors are each responsible for shipping of the above prizes. No blog associated with this contests are responsible for prize fulfillment. If you would like to be a sponsor in a giveaway like this please email Melissa Cushing at mcushing7 (at)hotmail (dot) com. If you take an entry you must stay following for the entire contest or you will be disqualified. Are you just here for the food? CLICK HERE!